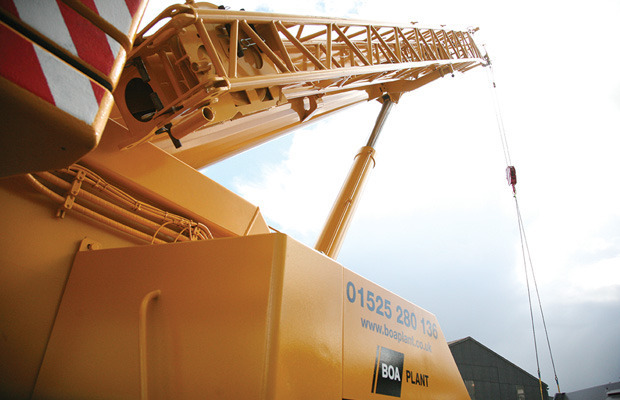 BOA Plant has taken delivery of a new 50 tonne mobile crane, increasing the division’s fleet to three following its formation in 2012. The delivery of the Liebherr LTM 1050-3.1 represents another sizable investment in the division and provides an excellent accompaniment to the current fleet, allowing a significant increase capacity. Originally formed as a division providing crane services to the main trading company - Barretts of Aspley, the division has enjoyed a lot of success since its formation, securing works with external customers providing contract and non-contract crane services. Fronted by Plant Manager, Sam Barrett, the division has secured a number of long term customer hires in Slough, Northampton and Coventry as well as continuing to provide Barretts of Aspley with contract crane services at Blackfriars, Hackney and Cambridge. Given the volume of work coming from both internal and external sources, the division made the decision to invest in the new crane. As with the other cranes already on the fleet, the division opted for a Liebherr crane as they remain the market leaders in terms of reliability and capability, and are the preferred crane of choice for the drivers on the fleet. Capability and reliability are critical to BOA Plant being able to service the work it is currently securing so keeping with Liebherr proved to be the most sensible choice. The new crane is currently under-going sign writing and final servicing prior to being available for hire later this month. A team of BOA group staff competed in the Royal Wharf Charity Football Tournament at Shoreditch Powerleague. BOA Plant are proud to launch our transport and haulage services to our customers. BOA Plant were once again proud sponsors of this years Bucks County Show event on Thursday 30th August. BOA Plant Proud Principle Sponsors of the Bedford Young Farmers Rally 2018! The BOA Plant team set up a fantastic display at this years Bedford Young Farmers Rally, displaying our range of mobile cranes and plant machinery, giving enthusiasts of all ages a hands on experience with some of the highest spec machines available on the market.